Home » ★★★☆☆ » Wiltons. SW1. History on a plate. Wiltons. SW1. History on a plate. 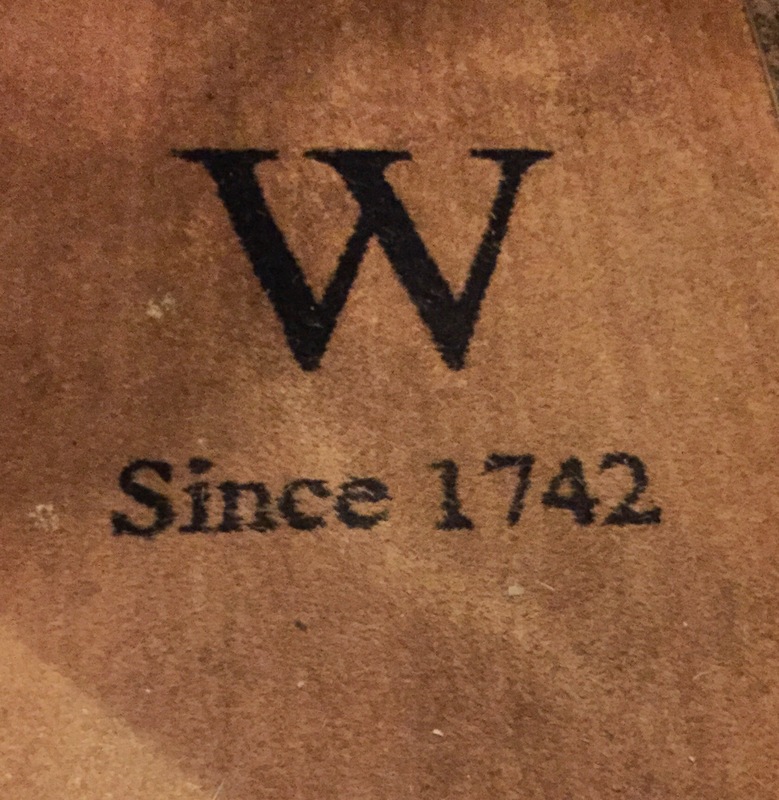 It’s been there since 1742, according to the doormat. Bang in the heart of hunting-shooting-fishing-land, you can stock up on all your country needs before you come here and eat something that someone else has had the decency to shoot for you. Wanting, nay needing to avoid anything remotely festive, when Wiltons pinged up on my trusty Opentable app, it seemed just the ticket. Surely at this temple to tasteful, there would be no tinsel, no tacky Christmas songs and no rowdy Christmas parties. As it transpired, whilst seated at our lovely corner table in a room off the main drag, there was a steady procession of well-oiled City-types, who wove their way past our table, to a private room where what sounded like a Bacchanalian feast was in full swing. Fortunately the doors to that room were rather heavy and muffled most of the mayhem. Would madam like a glass of champagne? No, madam would not. Madam, who is a miserable old bag does not like the automatic offer of a glass of champagne in restaurants, which makes her feel like a curmudgeonly refuser and sets her off on the wrong foot for the evening. Madam is not, by the way, a great lover of champagne, preferring, as is well documented, the alcoholic Ribena-esque taste of a Kir. There is no point pretending that I prefer an Aperol spritz. The menu is what you would expect from this paean to all things grand-luxe Brit. Oysters, caviar, three types of smoked salmon, a truffled goose foie gras en crôute for four at £180 before service, any of these traditional items might take your fancy. You may be disappointed to know that I passed over the foie gras and went for the more modest potted shrimps, at a mere £14. 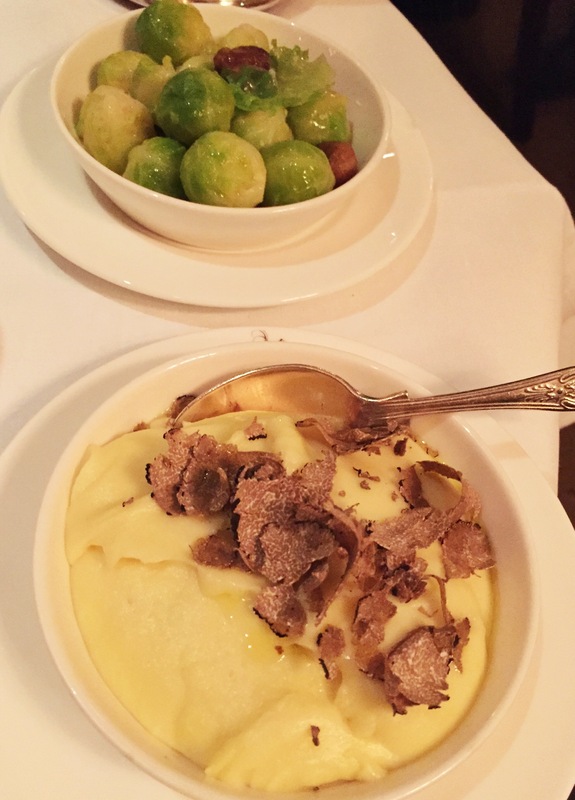 I considered scrambled eggs with white truffle, but the £60 price tag acted as an effective deterrent. 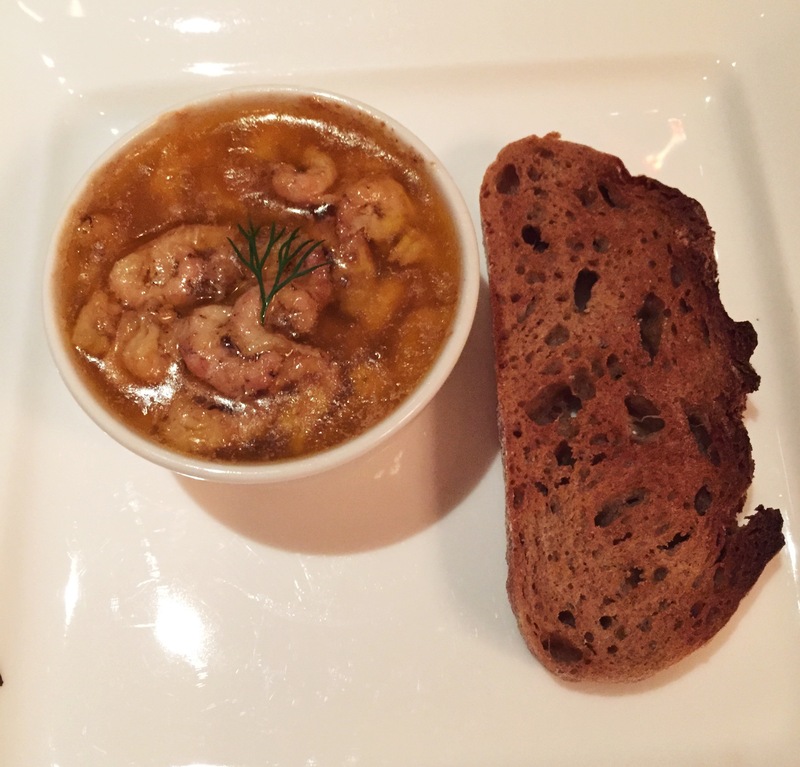 The shrimps were offered cold or warm and I thought I’d go for the latter, as it was chilly outside and I thought it would just be similar to the solid butter version, but possibly at room temperature, rather than fridge cold, which I don’t love. For some reason, probably my own stupidity, I was not expecting the shrimp to be floating in a melted butter bath. A mere hint of mace and one measly toast , it’s fair to say that the mask of disappointment was settling over my face. Disappointed-with-an-undercurrent-of irritation is C’s default face and his native lobster cocktail did nothing to shift it. For £35, I’d really expected there to be a transition to his things-aren’t-so-bad face but it wasn’t to be. Ordinary, he said, and not much bang for your buck. Having said that I didn’t want any Christmas nonsense, I was a teensy bit disappointed not to have been shown the carving trolley, with its enormous dome, hiding an enormous, glistening, glorious turkey. Maybe my Christmas humbug-face had put them off, but our neighbours were given the whole display. Did I not look like someone who’d appreciate a bit of trolley action? Is it only for regulars? I’m not saying I’d have ordered it but who knows? I might well have made this my first turkey-taste of the season. And I do love a decent stuffing. 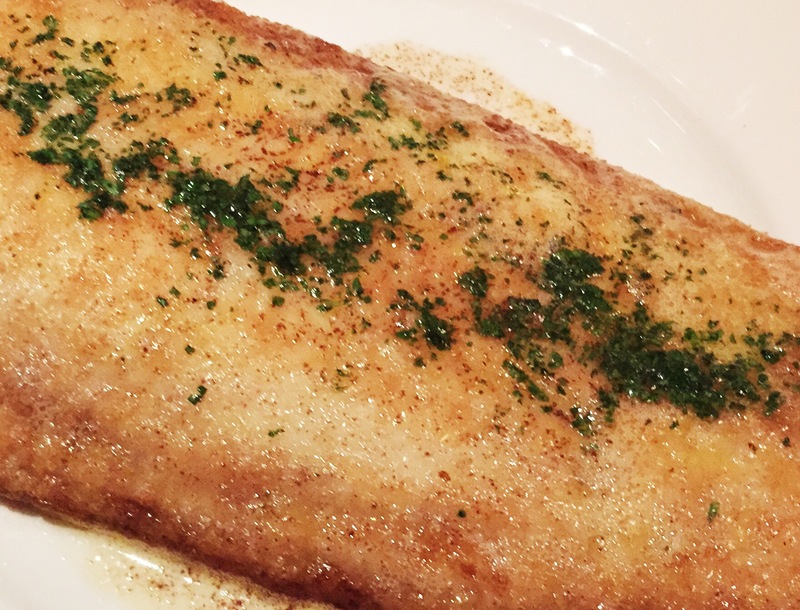 We shifted right back on track with the Dover sole, meunière, on the bone, as if there is another acceptable way. As good a piece of sole as I’ve tasted in some time, this was juicy and plump, buttery and firm. And at £48, without any trimmings or service, I’d expect a fantastic fish. It is, I heard the waiter say more than once, their signature fish dish. C did not partake of my mash with truffles, a plateful of buttery joy with generous shavings, as he was low-carbing it with his celeriac purée. His self-control can be rather irksome. I had a rather pedestrian side of sprouts, bacon and chestnuts. Two tiny little squares of bacon didn’t cut it in the bacon stakes. Because C also isn’t eating sugar, (yawn) he refused to even look at the dessert menu. Obviously I could have eaten the soufflé (“but it’s so light, we could share”) or the warm chocolate fondant ( “it’s probably 70% chocolate, hardly any sugar at all in that”) but his face was set against it and I could not bring myself to eat it on my own. Especially since I’d eaten his portion of rather mediocre over-firm white baguette. 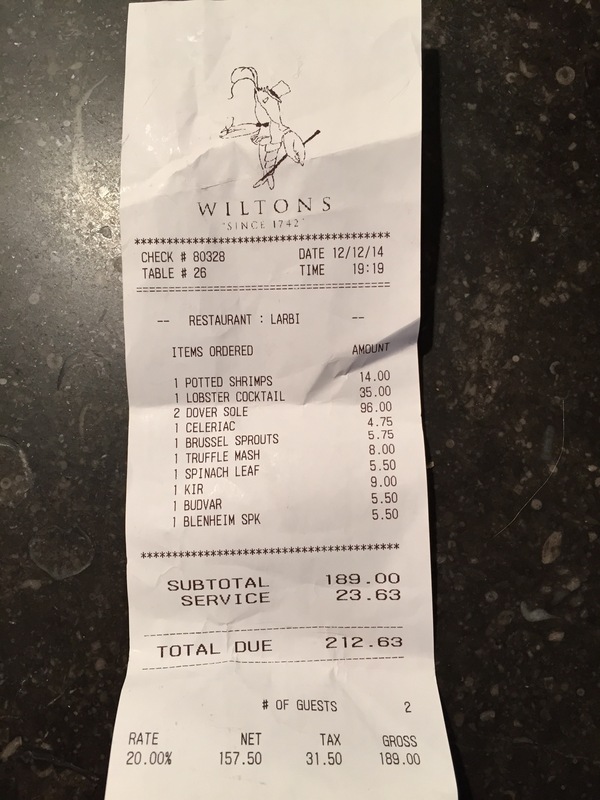 The last time I visited Wiltons was with a much older client, back in the late 1980s and I remember thinking how grown up it was and how terribly formal. Intimidating, even. I’m a little more grown up now and a little less overwhelmed by the reputation, the slick service and the formality. I love the history but it comes at a cost. One superb sole was not enough to lift the meal from the mostly middling to the memorable. A little tired, it seemed, though you would be, after two hundred and seventy-two years. Spot the bacon, behind the mash of marvelousness. Objects in the picture are smaller than they appear. 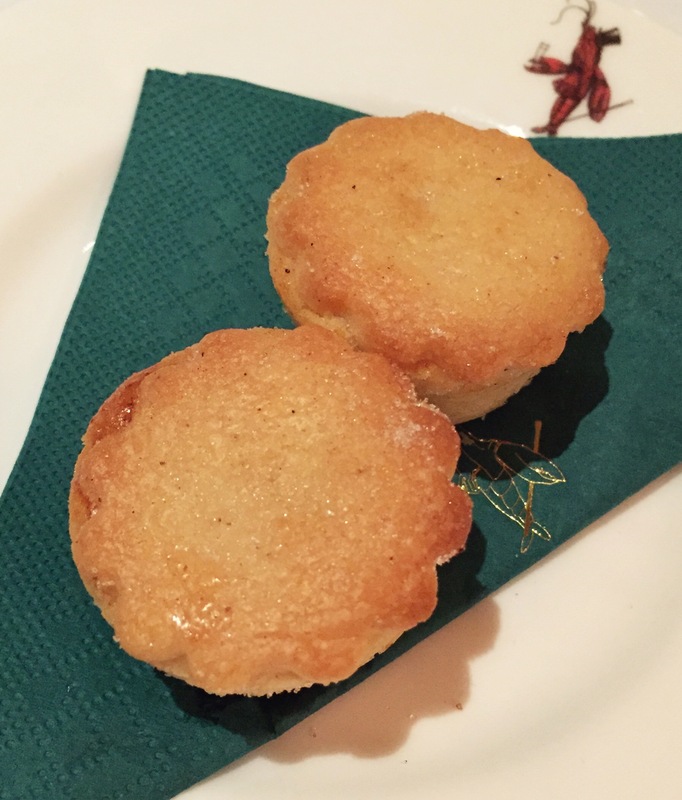 Mini mince pies to end. Get a booth. For ageing lovers everywhere. In case you had forgotten. A date with a mat. Excellent review, with the right combination of a mordant tone and good critical judgement, as one has come to expect. I must say all-in so to speak, this meal sounded very good. If you can get a Dover sole as good as these sounded, the rest is all just a distraction, eh? (True, price/value considerations can obtrude, but one has to park them sometimes at the door, like suspending disbelief a la Coleridge…). As a Canadian who only rarely has tasted the real thing, I’d give my eye teeth for the experience again. The last top quality Dover sole I had was at Manzi’s in Leicester Square. I understand the restaurant closed some years ago, so it is good to know the real thing is still available. 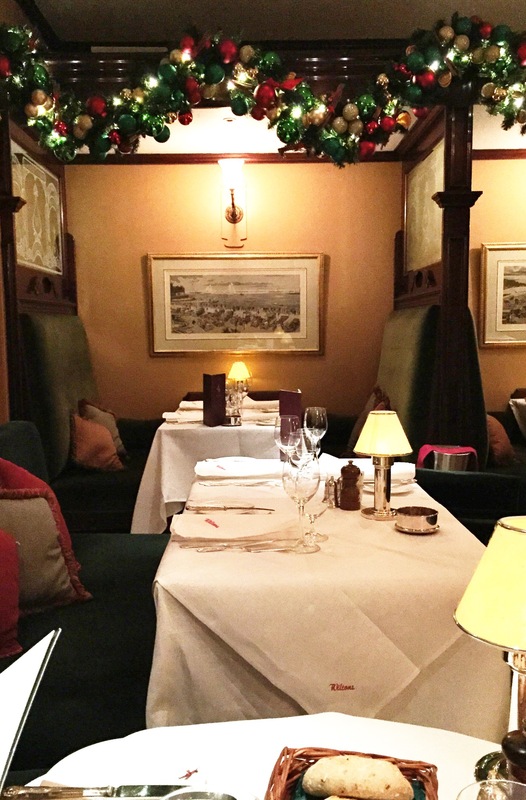 In the 1980’s, a writer, I believe the name was David Benedictus, wrote a superb guide to London and he recounted the excellent Dover sole at Manzi’s. He said you needed to eat it with new Jersey potatoes and Bendick’s bittermints to finish. I’ve been lucky enough in my life to replicate that experience, at the self-same Manzi’s, and it was one of the best meals I’ve had anywhere. In a way though, I was sorry to read you didn’t try the turkey which by the sound of it must have been really good. Perhaps you might go back, or at another place offering the same kind of quality. Please do keep these reports coming, they are followed closely and with great interest. There are probably others as well. I am going to try Rules in the new year, as a contrast and compare excercise. Thanks and good to know real Dover sole is still available, that blogpost idea sounds great.